In the course of creating and updating my guidebooks to Argentina, Chile, Patagonia, and Buenos Aires (including coastal Uruguay), I have normally traveled by automobile. The distances to be covered are great - Argentina is the world's eighth largest country, only slightly smaller than India, and Chile's territory extends from the tropics to the sub-Antarctic. The destinations are numerous, and many are remote, with little or no public transport. Given the compressed time frame in which I have cover this territory, the car has proved to be my most efficient means of transportation; once in country, I rarely fly, though I occasionally take buses and ferries (as I'm writing this, I'm on the Navimag route from Puerto Montt to Puerto Natales, with my car on board, and I usually travel from Buenos Aires to Uruguay by ferry). In nearly two decades of guidebook writing, I've thus driven hundreds of thousands of kilometers - an update of Argentina, for instance, means a roughly 15,000-kilometers (9,000-mile) road trip. I've never aspired to the kind of experience that Tim Cahill chronicled in Road Fever - driving from Tierra del Fuego to Alaska's Prudhoe Bay in 23 days to make the Guinness Book of Records - but I do have to cover lots of ground in a short time. From the first, I realized that renting a car was impractical - or rather, simply too expensive for a job that combines long hours and low pay. Since then I've gone through five cars: 1) a 1969 Argentine Peugeot panel truck that belonged to my father-in-law; 2) a 1979 Toyota pickup that I shipped from California but donated to a Chilean non-profit partly because the cost of shipping it back would have exceeded the vehicle's value; 3) a 1988 Toyota 4WD Xtra Cab that I did ship back to California; 4) a 1992 Nissan Terrano/Pathfinder that I purchased in Santiago but wrecked (with extenuating circumstances) on the Carretera Austral; and 5) a 1996 Nissan Terrano/Pathfinder (pictured above) that I purchased to replace the former and have now had for five years. While short term visitors to southern South America find it most convenient to rent a car, those who are spending at least four months should consider purchasing one - presuming the car is in good condition, this can prove as cheap or cheaper than renting. Buying a car, though, requires caution, and not just because it might have mechanical problems. There can be bureaucratic obstacles to navigate, especially in Argentina, and I would recommend buying a Chilean car, preferably in Santiago where there's a critical mass of good used vehicles at reasonable prices. Buying a Chilean vehicle is relatively straightforward. To do so, you must first obtain a Chilean tax ID (Rol Único Tributario, or RUT) from the Servicio de Impuestos Internos (SII, Chile's Internal Revenue Service), which takes only a few minutes at any SII office). Once you find the appropriate vehicle and agree on a price, there are a few other items to take care of, but it's a fairly simple process that's detailed in Moon Handbooks Chile. After a couple days, you're free to take the car where you like - including over the border into Argentina. That, in fact, is why I would encourage anyone to purchase a vehicle in Chile rather than Argentina, where the process can be Kafkaesque. As in Chile, non-residents can purchase Argentine vehicles, but there the similarity ends. A few years ago, a U.S. journalist friend of mine who was then living in Buenos Aires (and working for a rival guidebook company) wanted to explore Chile's Carretera Austral. When he arrived at the Argentine border post, in Chubut province, Argentine customs refused him permission to take his Pathfinder into Chile on the grounds that it was a vehículo nacional (Argentine vehicle) that a non-resident foreigner could not take out of the country - even though it was his private property. This was why, when I purchased my old Peugeot panel truck, we left it in my Argentine father-in-law's name. Ironically and absurdly, a non-resident foreigner can cross the border in a vehicle that is not his or her personal property - with the appropriate power-of-attorney. The upshot, which seems ridiculous, is that you cannot cross the border with your own Argentine vehicle, but you can do so with someone else's. It gets even more absurd. A few years ago, in southern Argentine Patagonia, I met a young Argentine woman, from the Braun-Menéndez dynasty of Patagonian wool barons, who had been living for several years in Brazil and had recently married a Brazilian. For their honeymoon, they decided to visit the old family properties in Patagonia and left São Paulo in her car. On arrival at the border, though, Argentine authorities refused them entry on the grounds that an Argentine could not import a foreign car, even temporarily, into the country. Their solution was to return to the Brazilian city of Curitiba, where they obtained a power-of-attorney in the husband's name. On returning to the border, the crossing was routine - except that the same authorities informed them that only he, not she, could drive. Until recently, that was the silliest story I had heard about Argentine customs, but I recently met, in Puerto Octay, a Swiss family who purchased a 4WD vehicle in Bariloche and attempted to travel to Chile, only to be denied an exit permit at Paso Cardenal Samoré, west of Villa la Angostura. Returning to Bariloche, they contacted the seller and then obtained a power-of-attorney that allowed the seller's brother to drive the car over the border - thus evading Argentine regulations. They then paid the brother's bus ticket back to Bariloche but, when they return to Argentina, they'll have to bring him back in order to cross the border again. Last Thursday, I took a drive from the city of Castro, on Chiloé, to the ferry port of Quellón at the south end of the island. As I approached Quellón, the view across the Golfo de Corcovado included an enormous plume of ash and smoke, at least twice the height of surrounding cumulus clouds, from the still active Volcán Chaitén. The photograph here was taken from a distance of roughly 85 kilometers. Tomorrow afternoon or early evening, I’ll have a chance to see the plume closer up, as the Navimag ferry Evangelistas (pictured here at anchor in Angelmó, near Puerto Montt) will sail past it en route to Puerto Natales. I won’t get a chance to see it any closer up, though, until next month, when I head back overland via Argentine Patagonia. Meanwhile, so I’m told, the southbound ferries that are usually so full at this time of year are less so this season. That’s because, when Navimag fixed this year’s fares, it did so after the 2008 summer season, when the strong peso raised their costs, and the cheapest fares rose from US$410 to US$510. While the more expensive cabins are still fully booked, the less expensive berths have proved too pricey for many budget travelers, and many of them are going empty. Navimag has recently introduced student discounts on the route, making the fare closer to last year’s in dollar terms; with a stronger dollar buying more pesos, they may still come out ahead. Win This Book - in Chilean Patagonia! On Monday afternoon I will be sailing, for at least the sixth or seventh time, from Puerto Montt to Puerto Natales via the Patagonian Channels on the Navimag ferry Evangelistas. In my opinion, the nearly three-day trip, which arrives in Puerto Natales on Thursday morning (weather permitting) is one of the Southern Cone's highlights, with almost unmatchable maritime scenery (a sample appears here). The night of my arrival, Thursday January 29, I will be giving a slide talk and question-and-answer session at the Hotel Indigo's Pisco Sour Café (the café is in the foreground, the hotel in the background), at 9 p.m. Everyone is invited, and there is no cover charge (though food and drinks are available). As at my recent event in Pucón, we will be raffling off one copy of the new edition of Moon Handbooks Patagonia among the attendees. Hotel Indigo is at Ladrilleros 105, tel. 061/413609, and fronts directly on the shoreline Avenida Pedro Montt (though the entrance is around the corner on Ladrilleros). South America’s west coast is the mirror image of North America’s, and the archipelago of Chiloé has a geography similar to British Columbia's Vancouver Island - a stunning, densely forested Pacific coastline that alternates rocky headlands and seemingly endless beaches. Like Vancouver Island, Chiloé has a climate that can make drizzly Vancouver or Seattle feel like the Mojave Desert. That’s not been the case since I arrived yesterday in the city of Ancud, on a blindingly sunny afternoon looking across its namesake bay. Today, according to an online weather service, the temperature reached 24° C (75° F), but with no wind it seemed at least five degrees warmer. I took advantage of the brilliant morning to drive to the oceanside locale of Puñihuil (pictured above), where the Monumento Nacional Islotes de Puñihuil is one of Conaf’s smallest protected areas - only nine hectares of offshore islands. Those islands, though, have something the Pacific Northwest can’t match. Here is where the ranges of the Humboldt penguin (which extends farther north) and the more southerly Magellanic penguin overlap, and their summer breeding colonies are almost side by side. In fact, the two species resemble each other, but side by side it’s fairly easy to distinguish them. I arrived fairly early at Puñihuil, where Chilote divers and fishermen who can’t take locos (abalone) at this time of year supplement their income by shuttling tourists out to the islands to view the penguins (the Magellanics appear in the photo here), four species of cormorants, and other seabirds (though landing on the islands is prohibited). I was in no hurry, but soon wondered whether anyone else was going to take advantage of such a magnificent day. The half-hour tour costs only about US$7 per person, but photography is difficult in the choppy seas around the penguin colonies. As it happened, about an hour later, the vans and buses started arriving. Still, as four of the five operators here now cooperate on filling their launches and then share the day’s earnings, there are never so many boats on the water as to disturb the birds. According to Britt Lewis, a former Peace Corps volunteer who now runs the Austral Adventures company out of Ancud, it was a free-for-all until last year, and there are hopes of bringing in the last holdout. Today in Puerto Varas, I met a Swiss tourist who had lost his travelers’ checks and will have to wait until next week to have them replaced. In reality, I was surprised to find anyone carrying travelers’ checks these days as, in Chile and especially in Argentina, cashing them can be a bureaucracy-filled nightmare. It almost invariably requires visiting a bank or, alternatively, an exchange house, and they often take unconscionably large commissions - up to five percent and sometimes even more. Their hours are often inconvenient. When I first visited South America, in the mid-1970s, there wasn’t much alternative to travelers’ checks, but the modern prevalence of ATMs has made them seem positively quaint, but it wasn’t always so. When I first visited Argentina and Chile in 1979, I hitchhiked from San Carlos de Bariloche to the southern Chilean city of Osorno, founded in colonial times but transformed by German immigration in the mid-19th century (the photograph here shows one of the city’s Germanic monuments, now a cultural center). It was the long Easter weekend, and I found myself with a few US dollars and American Express TCs, but without any Chilean currency. At that time, under the Pinochet dictatorship’s regulations, only banks could change money, and I found myself unable to pay for a room or even buy food. 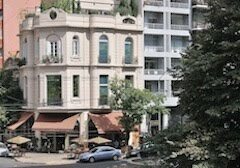 One Chilean with whom I spoke suggested visiting one of the city’s more prestigious hotels, as they often changed money surreptitiously for their guests. I chose the Deco-style Hotel Waeger, whose German name suggested it would get at least some international clientele at a time when few foreigners visited Chile. Despite my then limited Spanish, I approached the front desk and asked if they could change a few cash dollars into Chilean pesos. No, they told me, government rules prohibited their doing so. At that time, though, I spoke better German than Spanish and, on impulse, I asked in German whether it was impossible to find a place to change money until Monday. The response, in German, was “How much would you like to change?” and an inquiry into what part of Germany I was from (in high school and university, all my instructors were native speakers, and my accent is still very good, even though my vocabulary and grammar have deteriorated). Even after explaining that I was American - which shocked them, as so few Americans can handle German - I had enough Chilean cash to get me through the weekend, though I couldn’t afford to stay at the Waeger. This will be a short entry, as I'm about to depart the city of Valdivia (whose colorful riverside fish and produce market is pictured here) for the southern Chilean town of Puerto Octay on Lago Llanquihue (pictured below, at sunset, with Volcán Osorno in the background). At the same time, I want to mention/promote the relaunched website of Moon Travel Guides, my main publisher, for whom I do guidebooks to Argentina, Buenos Aires, Chile, and Patagonia. Much more interactive than it has been, it now offers many more travel planning suggestions than in the past. At the same time, it's featuring informative blogs by Moon authors/experts such as Josh Berman (Tranquilo Belize), Chris Baker (Cuba & Costa Rica Journal), and Al Argueta (Guat's Going On; Al succeeded me as author of Moon Handbooks Guatemala, ). I will also be participating in this through my Moon over South America, which will include some of the same entries as this blog, but will also include original work for the Moon site. This will be the place to learn the latest, and ask your questions, about travel in the Americas. In May of 2008, as many readers know, the ashfall eruption of Chile’s Volcán Chaiten and subsequent flooding caused the evacuation of its namesake town and disrupted traffic along the Carretera Austral, the discontinuous southern highway linked to the “mainland” by ferry. According to the Santiago daily La Nación, the government has narrowed the choice for a re-sited Chaitén to Santa Bárbara (about 10 km northwest of the current site) and Bahía Pumalín (farther north, with a sheltered harbor but no infrastructure whatsoever at the moment). The latter is likely safer, but it’s uncertain how many chaiteninos will return to the area. Chaitén presumably remains under evacuation orders, with the Carabineros police patrolling it to prevent looting, but Naviera Austral ferries from Puerto Montt, Hornopirén, and Quellón (on the Isla Grande of Chiloé) have resumed and, according to a Naviera Austral representative I spoke with this morning, the ferries are once again carrying foot passengers, in addition those with their own transportation, and it is once again possible to stay in Chaitén. Mario Urrutia of Sernatur's Puerto Montt office confirmed this, and also said it is once again possible to overnight in Chaitén, but they do not recommend it. Meanwhile, Richard Figueroa of Sernatur's Futaleufú office tells me that Chaitén's Hotel Schilling and Cabañas Pudú, both along the waterfront road, are offering accommodations and that buses are meeting every ferry and can take passengers to the towns of Villa Santa Lucía and Palena. Anyone who wants to continue to Futaleufú, though, will have to hitch the last 48 km from the Puerto Ramírez junction. There are, however, bus services from Futaleufú south to Puerto Puyuhuapi and Coyhaique, but their northbound schedules are badly timed for ferry arrivals at Chaitén. Another “casualty” of the eruption has been the ferry port of Caleta Gonzalo, the gateway to environmental philanthropist Doug Tompkins’s Parque Pumalín. In a telephone conversation from Pumalín’s administrative headquarters at Puerto Varas, Carolina Morgado told me there has been no damage to the facilities at Caleta Gonzalo (pictured here), but the road south to Chaitén is impassable for the time being, and thus Pumalín’s facilities - campgrounds, café, cabañas - are closed for this year. Nevertheless, for those who can get to the region - either by the Carretera Austral or through Argentina - the whitewater Mecca of Futaleufú has mostly recovered from the ashfall it suffered during the eruption. According to Rosi Spelius of Futaleufú-based Expediciones Chile, everything in town has reopened and, if the water isn’t quite so clear as in previous years, the kayaking and rafting are as good as ever. Yes, it's another contest, but there's a catch. Whoever wants to take home a copy of the new edition of Moon Handbooks Patagonia will have to make it to Pucón, Chile, by 8 p.m. Wednesday evening. That's when I will be a giving a slide talk on Patagonia at Hostería ¡Ecole!, the ground-breaking hostel created by a group of 40-some environmental activists, both Chilean and foreign, 15 years ago in the country's adventure travel capital. Everyone who attends can participate in a drawing for one free copy of the book - sorry, but I can only carry so many on the road with me. The talk will cover Chilean and Argentine Patagonia, as well as the Falkland Islands and the capital cities of Santiago and Buenos Aires, to be followed by a question and answer period for as long as anyone feels like hanging around (the event takes place in the hotel bar/cafe, so drinks and food will be readily available). There is no admission or cover charge, nor any obligation to buy food or drinks. ¡Ecole! is at General Urrutia 592 in Pucón, tel. 045/441675. For most of the 1990s, with an overvalued peso at par with the US dollar, Argentines traveled abroad just as, over the past decade, US residents bought houses they couldn’t afford. One of their favorite choices was nearby Chile, whose undervalued peso made it a bargain for visitors from across the Andes. Within Chile, one of their top destinations was the Pacific Ocean beach resort of Viña del Mar (pictured here), where their money went farther than it did in their own Atlantic coast city of Mar del Plata. All this changed in 2001-2, when the Argentine peso collapsed - within a few months it was close to four pesos per dollar - and emergency banking restrictions limited access to their accounts. Only a handful of those Argentines who could afford vacations could travel to Chile, much less overseas. In fact, over the ensuing six years, the flow of tourists reversed and the province of Mendoza even invited Chileans to celebrate their mid-September patriotic holidays in Argentina. In a sense, this was the “revenge of the Chileans” after a decade-plus of summertime invasions from Argentina. 630 per dollar - nearly 50 percent. The exchange rate once again favors Argentines, though how long this may last, given Argentina’s own economic problems, is a separate issue. According to the Chilean daily La Tercera, this is the world’s sixth-greatest devaluation in this period, though their article calculates the percentages with appalling inaccuracy. According to Mercopress Noticias, the Chilean state tourism authority Sernatur expects 150,000 Argentines to visit Viña in January and February, though other destinations, such as the Andean lakes district around the towns of Pucón and Puerto Varas, should also get increased numbers. Visitors from Europe and North America should also find their currency going farther, and the Chilean tourism sector is rejoicing - with income in dollars, and expenses in pesos, not to mention increased numbers drawn by the bargains, their earnings will go much farther this season. The Tercera article suggests that the exchange rate for the foreseeable future will fluctuate between about 620 and 660 pesos - good news for both operators and visitors.